I have always believed that fairy tales are part of growing up. I remember many a late night spent by the fireplace waiting for Santa’s head to pop out like a jack-in-the-box. I also spent years searching for the colorful eggs that the equally elusive Easter Bunny left in my yard. And while I never understood why a fairy would want to take my bloody tooth from under a pillow, that did not diminish my joy when I found the quarter in its place the next morning. When I had children, I continued the tradition. Cookies and milk were always left out for Santa every year. As they got older, my daughter even insisted on writing a letter to leave next to the plate. I enjoyed this just as much as my children did. I would leave half a cookie on the plate and even write a short response on the bottom of the letter. 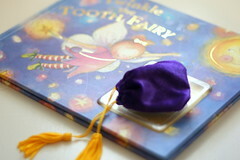 Due to inflation, the Tooth Fairy started leaving a dollar rather than a quarter. That was quickly replaced with gold coins – shiny and much more interesting. Sounds wonderful, right? It was. The smiles on their faces were all a mother could ask for. But I knew it wouldn’t last forever. My son discovered the truth on his own at school. He never told me when he found out. I just remember him recommending something to buy for his sisters Christmas stocking. Simple and pain-free. He was willing to keep up the conspiracy for her sake. I should have known, as different as they are from each other, that my daughter would not be so easy. Just the other night, she asked me if the Tooth Fairy was real. Busted! Of course, the Easter Bunny and Santa questions came next. Wow. How do you explain to your 10-year-old child that you’ve lied to them for years? Needless to say, it was a long conversation, and tears were involved. I am now kicking myself as I think I just earned the Worst Parent Ever Award. In the end, she forgave me. She said it was just like one of my stories, made just for her. This entry was posted in Family and tagged Childhood, Christmas, Easter Bunny, Fairy tale, Family, Folklore, Parenting, Santa, Tooth fairy. Bookmark the permalink. hahahaha, that’s greatness! I’m glad that she forgave you! My son has always known the truth, that the fairy tales we perpetuate are symbols of love and life and giving, and I still have the note he wrote me when he lost his last baby tooth “dear tooth fairy, this one is free, you don’t have to pay me for it, it’s my last baby tooth, so you don’t have to pay me or visit me anymore.” I gave him a big hug the next morning! Kids are so awesome. The way their minds work just blow me away. Your son’s note is a perfect example of that.